70% loan for third and subsequent houses? PETALING JAYA: There is speculation that the loan-to-value ratio for the third and subsequent house purchases could be further reduced to as low as 70% from the assumed rate of 80%. According to sources, talk of a loan-to-value ratio of 70% has surfaced but nothing has been decided yet and discussions are still ongoing. To recap, Prime Minister Datuk Seri Najib Tun Razak had said on Tuesday that Bank Negara might impose a limit on financing for subsequent purchases after the second property while first-time buyers can borrow up to 90%. It is reported that there were plans to lower the loan-to-value ratio for the third and subsequent house purchases to 80% from 90%. SK Brothers Realty Sdn Bhd general manager Chan Ai Cheng said a reduction in the margin of financing to 70% would affect property sales for investments initially. “There will be an impact on the property market. The more aggressive and gung-ho property investors may think twice about investing in properties if they have to cough up more money. “For example, a buyer who will have to pay RM50,000 deposit for a half a million ringgit property will now have to come up with RM150,000,” she said. That said, Chan admits that most investors would have surplus cash and not overgear themselves by taking a maximum loan when buying a property. “As with any new ruling, the market will have to adjust itself and find a new level,” she said. She suggested that the central bank should look at a lower loan-to-value ratio for properties that were more prone to speculation and not impose the rule across the board. An analyst with Affin Investment Bank said the loan-to-value ratio curb may not be imposed on the entire property industry, hence it should not affect the demand and sales of properties except perhaps in selective locations/projects with a higher rental market. “However, the guidelines do not appear specific at the moment. “There are also ways a purchaser can play around them. “We may not see a sharp pullback in terms of property sales and banks’ mortgage growth to be impacted badly,” she said. The analyst said more stringent measures, such as regulating the discount on base lending rates (which is currently at 1.8% to 2.2% in the market), barring interest-only payments or the absorption of interest cost by developers during the construction period would have a more drastic impact on property sales and loans. Other measures include increasing stamp duties or real property gains tax rather than imposing a cap on the loan-to-value ratio or even lowering the cap to 70%. According to AmResearch’s sensitivity analysis, bank earnings are not so sensitive to changes in loan growth. “We estimate that every 1 percentage point downgrade to our loan growth assumptions will lead to less than 1% downgrade in net earnings,” it said in a note yesterday. Thus, potential moves to reduce the loan-to-value of property related loans would not lead to any major downgrades to net earnings, AmResearch said. A bank official who declined to be named said most of the bank’s mortgage borrowers were buying residential property for their own stay and the proportion of borrowers who were buying such property for speculative purposes were small. “Hence I don’t see the loan-to-value curb significantly hurting our business. We also check the credit profile of our borrowers before deciding on the loan amount so if a customer’s credit rating is not so good we will reduce the loan amount accordingly,” he said. According to Bank Negara statistics, outstanding loans growth for the banking sector grew 11.9% to RM841.74bil in July year-on-year. 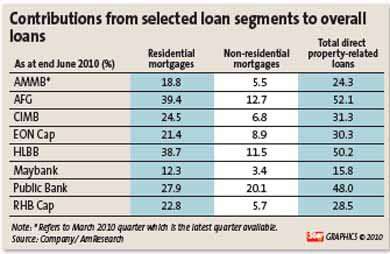 Mortgages make up the largest portion with some 26.8% of the total loans outstanding as at end July. The National House Buyers Association honourary secretary general Chang Kim Loong said a lower loan-to-value ratio for the third and subsequent house purchases was welcomed. He said property speculators have caused property prices to escalate throughout the years. “I would like to suggest that the loan-to-value ratio should be even lower, at say maybe 50%, so that those without upfront cash will not speculate on properties and deprive the genuine buyers from buying a decent house,” he said. PETALING JAYA: Sunway Holdings Bhd, via its unit SunwayMas Sdn Bhd, is tying up with Sri Lanka-based Dasa Tourist Complex Pte Ltd to undertake a mixed development project there with an estimated gross development value of RM250mil. Sunway told Bursa today that the project in Colombo will involve the construction of residential and commercial units. The joint venture will see SunwayMas and Dasa Tourist having a 65% and 35% stake respectively. Sunway said the mixed development will comprise of at least 318,000 sq ft of net saleable areas of residential units and 60,000 sq ft of net saleable areas of commercial units in Colombo city. “Sunway is constantly on the lookout for new investments. The Group has been in India for more than 10 years and the opening of the Sri Lanka economy to foreign investment and expertise allows expansion of Sunway’s geographical footprint to Sri Lanka which has a higher foreign currency rating as compared to India. “The proposed JV is not expected to have any immediate material effect on the earnings per share, net assets per share and gearing of Sunway for the current financial year ending Dec 31, 2010 but is expected to contribute positively to the future earnings of Sunway Group,” it said. Sunway Holdings Bhd will launch its RM250 million flagship commercial and residential project in Colombo, Sri Lanka, by the second quarter of next year. It will be the company's sixth overseas project. Sunway has four ongoing projects in Singapore and one in China. Sunway managing director Yau Kok Seng said it expects to get the approvals for the development, comprising a 34-storey tower with 70 commercial units and 180 high-end residences, in four months. Construction will start immediately and the project is targeted to be completed by mid-2014, he told reporters after the signing of a joint-venture agreement with Sri Lanka's Dasa Group in Bandar Sunway, Selangor, yesterday. Sunway is developing the project through wholly-owned unit, SunwayMas Sdn Bhd, in a 65:35 joint venture with Dasa Group, which is involved in real estate, tourism and fabrics. SunwayMas will undertake the development on 0.5ha of freehold land owned by Dasa Group. Yau said that Sunway was targeting more than 20 per cent net profit for the project. On the home front, Sunway's profit margin ranges from 15 to 30 per cent, while that from its projects in Singapore is 12 per cent on average. Yau said the residences in its Colombo project will be sold at more than US$200 (RM620) per sq ft, while the commercial units will be priced from US$350 (RM1,085) per sq ft.
"We are targeting locals and foreigners. We hope to sell up to 80 per cent of the project within the first year of its launch," he said. Yau added that Sunway will look at further collaboration with Dasa Group as well as other developers in Sri Lanka as it embarks on being a long-term player. The Sri Lankan government is giving incentives, such as a five-year tax holiday, use of duty-free imported and locally sourced building materials, and repatriation of funds invested, to woo foreign developers. Yau said the project will also act as a springboard for Sunway's other businesses, including civil engineering and construction, building materials, trading and manufacturing, and quarrying. "There are a lot of projects to build ports, bridges, roads and highways, and airport expansion in Sri Lanka. We are testing the market now through this project and will slowly tap other areas," he said. PETALING JAYA: SP Setia Bhd net profit increased 104% to RM87.3mil for the third quarter ended July 31 from RM42.7mil achieved in the same period last year. The net profit includes gain from the disposal of its investment property, Tesco Hypermarket in Setia Alam. SP Setia said told Bursa Malaysia its revenue rose 13.5% to RM414.9mil in the third quarter, compared with RM365.6mil in the same period last year. For the first nine months, it posted a net profit of RM176.7mil from a revenue of RM1.2bil, representing an increase of 54% and 17% respectively over the previous year. “The group’s profit and revenue were mainly derived from property development activities in the Klang Valley, Johor Bahru and Penang,” it said, adding that construction and wood-based manufacturing activities also contributed to earnings. SP Setia registered sales of RM1.95bil as at August 31, therefore essentially achieving its full financial year sales target of RM2bil with two months to spare before the period ends on Oct 31. “The 10-month sales value has exceeded by 18% the group’s highest ever sales value over one financial year of RM1.65bil recorded in FY09,” it said. President and CEO Tan Sri Liew Kee Sin said the group’s proactive moves last year to capture market share in the luxury high-rise and integrated commercial sector, while further consolidating its lead in landed residential segment, had borne much fruit. “Despite the financial turbulence at the time, we continue to invest substantially to improve both infrastructure and amenities in all our developments,” Liew said. KUALA LUMPUR: Selangor Properties Bhd’s (SPB) net profit plunged 77% to RM7.5mil for the third quarter ended July 31 against RM33.3mil a year ago when it posted higher unrealised foreign exchange gain and better profit from property development. The main contributors to net profit for the quarter under review were property development, investment properties and education, it said. Revenue was almost 40% down to RM42.5mil from RM70.6mil while earnings per share tumbled to 2.19 sen against 9.69 sen previously.